Call of Duty: Black Ops 4 Blackout Map First Look | Nerd Much? Activision and Treyarch offered us a fresh morsel of news relating to their heavily anticipated battle royale mode today. We’ve been given our first look at the Call of Duty: Black Ops 4 Blackout map, and as expected, some of these locales look familiar by name and by design. The publisher and developer are citing the Call of Duty: Black Ops 4 Blackout map as the largest ever in the long established franchise. Which makes sense, of course, as a battle royale mode has never been previously instituted within the Call of Duty series in the past. Black Ops 4 and Game Informer recently took a closer look at some of the features within the upcoming Blackout mode. At launch, the Call of Duty battle royale will thrust 80 players into the battlefield. However, Treyarch states that number could increase later down the line. The interview also confirmed that zombies will somehow be incorporated into the Blackout mode too. And that land, sea and air vehicles will be accessible by players. 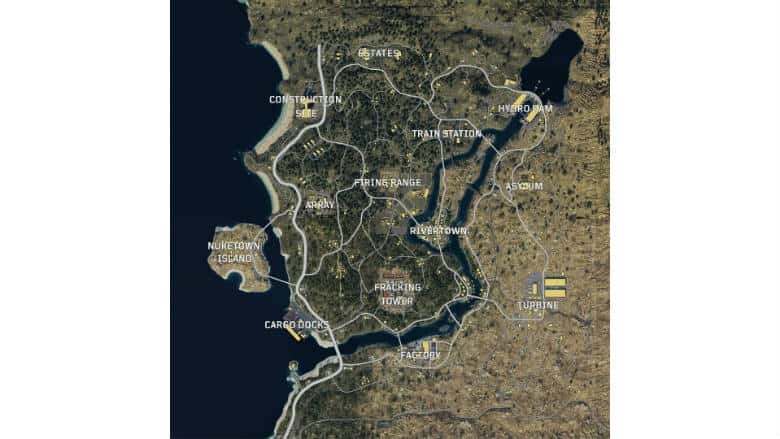 Looking at the Black Ops 4 Blackout map, they even look to be necessary to quick make it to some of the more decentralized locations. The details are beginning to flow in faster than ever. The Call of Duty: Black Ops 4 beta will begin on September 10th. The full game will then release worldwide on October 12th.